> > network proxy transparently. > > network packets sent to/from the Windows network stack. > > machines we encountered a problem. > > > - Everything works well before we start our app. > > packet couldn't be sent out. > > to work again. > > > > Which checksum offload? Just TCP or IPv4 too? 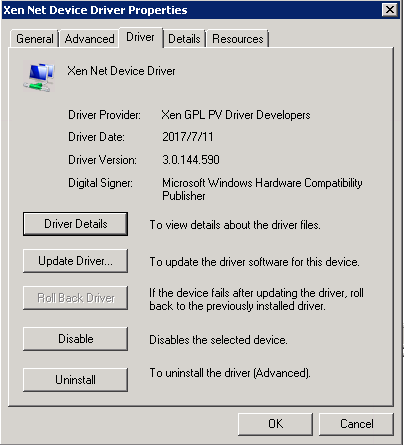 > Ok, that tells me you are not using Xen Project PV drivers. Where did you get your PV drivers from? > > Can I use Xen Project PV drivers for Citrix Products for they are still Xen Server based anyway? > > may be something wrong with this option ON. > > > 2. If this belongs to Xen Net driver, does the latest driver fix this? > > context, I have no idea if it is necessary or not. > > > Any comment or suggestion is appreciated. > > offloads in the 8.x drivers. > > > > > By the way, it seems I cannot install 8.x Xen Net Driver directly. > > The OS keeps telling me my old driver is the best one.